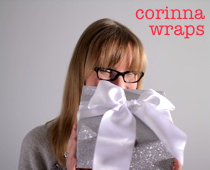 Want even more gift wrapping tips than what you’ll find here on the CorinnaWraps blog? Sign up for my newsletter! Every edition also features exclusive tips you won’t find on the blog, plus news of events and more. Sign up by Friday at midnight [Update: That’d be midnight Eastern Time] so you don’t miss out!